This paper presents a compositional and hybrid approach for the performance analysis of distributed real-time systems. The developed methodology abstracts system components by either flow-oriented and purely analytic descriptions or by state-based models in the form of timed automata. The interaction among the heterogeneous components is modeled by streams of discrete events. 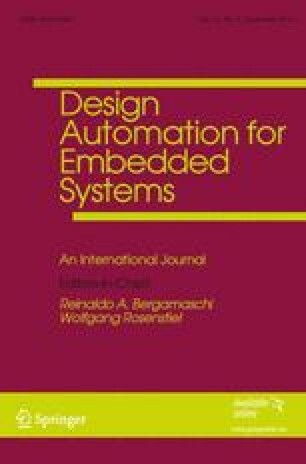 In total this yields a hybrid framework for the compositional analysis of embedded systems. It supplements contemporary techniques for the following reasons: (a) state space explosion as intrinsic to formal verification is limited to the level of isolated components; (b) computed performance metrics such as buffer sizes, delays and utilization rates are not overly pessimistic, because coarse-grained analytic models are used only for components that conform to the stateless model of computation. For demonstrating the usefulness of the presented ideas, a corresponding tool-chain has been implemented. It is used to investigate the performance of a two-staged computing system, where one stage exhibits state-dependent behavior that is only coarsely coverable by a purely analytic and stateless component abstraction. Finally, experiments are performed to ascertain the scalability and the accuracy of the proposed approach.